Every once in a while a great letterpress story from the distant and not so distant past surfaces. If you are lucky like me, you have the opportunity to work with older letterpressmen filled with interesting war stories. Personally I could listen to these all day. As we sit around the hot stove here, I’m inviting everyone to share a favorite story or anecdote from their experiences, whether it is a super long handfed run, working on a notable piece, press mishaps etc. An older gentleman that used to work with me, went to adjust a sucker on a windmill as the press was running. This was a man with 50+ years experience mind you. He unfortunately had less than perfect timing as his index finger was just above the sucker bar as the gripper came down, and the gripper got hold of the skin on the finger and well, you can figure out the rest. The kicker? It was 15 minutes before his week vacation started. I would like to know how many of the oldtime printers have seen type lice? I doubt that any/many of the newcomers have. I remember the a story told about a weekly newspaper/ job shop near here. The building had once been a hatchery, and they would wash the floors with water from a hose. The editor came to work one morning and found that his entire operation — flat-bed Babcock press, Linotype machine, counters, desk, handset type, job presses, etc., etc. — was in the basement. All those years of floor washing had rotted the ends of the floor joists. The weight of all that printing equipment finally did the trick. After the floor was rebuilt, publication resumed. That one reminds me of another. A colleague of ours in a neighboring town, purchased a windmill and was having it moved to the second floor of a factory. There was no other way but to go up a flight of 20+ stairs. The stairs were plenty strong enough, but at the very top, they lost control and the Heidelberg tumbled all the way down to the bottom. My shop is in my living room, or rather is my living room. To keep down fuel oil costs I never set my thermostat at more than 60. The ink plate seemed a bit cold so I thought I might use the old printer’s trick of setting a candle under it. After thinking about it for a while I decided that I would prefer not to have wax dripping on the carpet and, even though it was not great, to avoid any potential fire hazard. I figured I could use a clamp-on socket with a floodlight and achieve the same end. After much fiddling and experimenting with where to clamp it so the bulb would be the right distance from the plate and still clear the press mechanism I was ready. A perfect marraige of old ideas and new technology. Traditions maintained and modern innovation embraced: I was a credit to the craft. I dressed the platen, inked the pate, and flipped the switch. Here we go! One, two, three; feed the press; now we’re cooking with gas. As a kid (40+ yrs. ago) it was one of my duties to clean up the old C&P at the end of each day. It seemed the mice that lived in the shop had an affinity for black ink and each morning we’d find little black footprints all over the presses. Everyone thought this was funny except the person who had to clean up the footprints & mouse poop (me). I asked the foreman to purchase some traps but he refused. One morning we came to work and there were our brand new rollers with holes chewed out right of the middle. I couldn’t help but tell the foreman “Now will you buy me some mousetraps?” A pretty expensive lesson on trying to save a few pennies! Fatsean, I have witnessed with my own eyes, a mouse pigging out on a chunk of dried black ink. We actually felt bad for it and gave it some bread. On the subject of the nasty affliction of typelice. There was an employee a while back that had fallen victim to typelice and other “troubles” in the shop. He had been victimized so often, that when we asked him to go to another shop to pick up a reverse numbering machine, he adamantly refused. We have to great men that still work at our shop part time. One was the composer years ago and the other the pressman. The composer delights in telling the story of the day the owner asked the pressman to set a line of type. He was obedient, set the line, proofed it and showed it to the owner. The owner looked it over for all of a tenth of a second before asking “What is this chinese?”. Seems the pressman had set the entire line in Old English Caps. We had a Heidelberg cylinder walk across the floor once. It was loaded to capacity with a heavy bed of type, and after everything was set up right, we cranked up the speed. Before we knew it, the press was sliding back and forth in its pan. It’s impressive (and scary) to see tons of iron move like that, but it has never been pushed to that point again. When our Heidelberg cylinders were installed the Pan was stuck to the floor with some special adhesive, and the machine was also then stuck to the pan. They never moved even when up to max. When we sold them, the engineers had a devil of a job to get them off, having to use hydraulic and screw jacks to lift and separate them from the mounting. We had two Kelley C model presses and there was only one guy who had learned to run them and when he passed away, the company decided to get rid of them. They were on the second floor and the only way to move them was to bust them up with sledge hammers and heavy saws. We had chains hooked into the third floor to lift some of the parts. It took many weeks. Those presses were built! And even the parts were a hassle getting on the elevator. Many years ago I raided the print shop of a large insurance company in downtown Des Moines. They had printed a lot of their own materials for decades via letterpress in a large shop in the basement of the building. I bought a little bit of type and got some free galley racks, etc out of the place. The person that was in charge of disposing of the shop was absolutely certain he could find a buyer for the large flatbed press down there. I told him that he would NEVER find a buyer, and besides that, it would be impossible to even get the press out of the building intact. He was incredulous and said it could probably be taken apart. I told him even if it was taken apart, the larger pieces still could not be taken out with breaking or torching them down into smaller pieces. He told me I was nuts. I told him to try to find out how it got into the building in the first place. I went back a week or so later and asked if he had figured out how to get the press out of the building. He said I was correct and that it would never get out intact. As I suspected, he said that the entire street had to be dug up in the 1920s and the press was brought down a dirt ramp and into the building through a hole that had to be punched in the wall at that time. There was no way that was going to happen again to get rid of this piece of basically obsolete equipment. It was hardly worth the trouble to pay to have it cut down into pieces and sold for the value of the iron. I suspect that the beast is probably still down there. We (Printers’ Hall in Mt. Pleasant, IA) obtained a Babcock cylinder press in northeast Iowa a few years ago. It was in the basement, but the building was in the edge of a hill so there was level access to the basement from the back. We did have to pay some carpenters to remove the back wall so we could extract the Babcock, and then they had to rebuild the wall once it was out of there. All this took place in one day. The story of type lice reminds me of when an old pressman once sent me around the corner to get a fresh bucket of halftone dots. to obscure from view the burnt job ticket. I just kept my mouth shut and laughed really hard inside. A former pressman added too much ink conditioner as he ran a job on a windmill. As he stood watching the job run, he slowly started to turn blue (reflex blue). The ink was too thin and was being thrown off the press. It happened so gradually that he didn’t know it until it was too late. He had turned into a smurf. The area around him also turned blue except for the wall behind where he stood. We all thought it was funny but he really thought he was going to die, so we had to try to act sympathetically while we helped him clean up. Hi Bill, Another one from the late forties!! One very hot summers day, around mid-afternoon, my mate was eager to get a job finished, so that he could wash-up the Bronze blue ink he was using, and go home knowing that he hadn’t to start again the next morning. The machine was under a roof light and the sun was shining on it, which helped in drying the ink; the forme was a complicated tabular affair made up of numerous brass -rule boxes with small 8pt headings. Anyway he decided to up the speed and was going along quite merrily when suddenly things started to slow down, he turned around to see what the cause was and was amazed to see that the three composition forme rollers had melted. Needless to say we had to have the job reset as there was no way we were ever going to get the gung from the rollers out of that small type. We had rollers for the windmills (for many years), and I suppose they were composition but they had actually started drooping and dripping onto the floor. We’ve never been able to get all that sticky mess off the floor and had to put large sheets of paper to keep from stepping in it. It’s between the 13x18 and the wall and out of the way. I did one time and tried to take a step and it actually pulled the shoe off my foot. Of course we’re using rubber rollers now. Bern Bennett’s experience on his Thompson British platen reminds me of my experience on the same machine. But first I have to say that it is one of the most magnificent automatics that I worked. Its feeding mechanism, method of lay and registration as well as delivery are inspiring, pandering to grain and very unusual shapes. Beating the Heidelberg hands down. 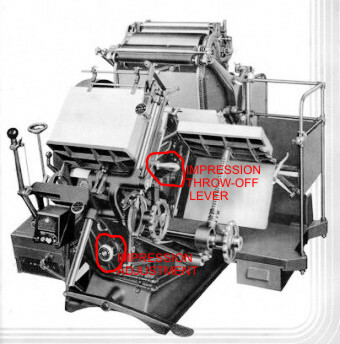 The only drawback was it could not print 2 envelopes simultaneously like the Heidelberg. My Thompson was a bit worn in the delivery shaft and bearings, so to encourage the delivery gripper bar to slide all the way along to grip the paper, I had it jacked and supported seriously to one side. It never failed to extract and deliver a sheet. Suppliers, making deliveries, took many photos. I was proud of my Australian initiative!!!! The Thompson I was referring too, was not the model with the straight feed and delivery. This was the model which I believe was made in the 1920s, and had the same type of “windmill” feed and delivery as the Heidelberg and this I think was why the firm were sued by Heidelberg and all the existing machines were supposed to have been destroyed. I have also operated the machines you referred to, many of which were made after world war2 at the Alvis car plant in my home town of Coventry. At one time the printers I worked for had three of these machines, and they were a delight to use; the straight feed was ideal for printing letterheads etc maybe not as solidly built as a windmill but nevertheless a good workhorse. Thanks Bern, always some thing to learn. I heard this one from a company I worked with, happened years before I started there. A manager at a good size company was hosting a job fair to try to bring in new people to the printing business. While he was taking people around he went by the windmills, as it was running he was showing parts of the press and his head got to close to the arm. He was knocked back on the floor with a good gash on his head. None of the job fair applicants applied for a job there. I was in my early teens and found a composing stick and wood type in our basement. My Grandfather had been a compositor since the early 1920s and my father had been in printing since he attended the NY School of Printing for high school. My Grandparents were coming to stay the weekend so I decided I would set the family name in type and put it on the mantel figuring it would give Grandpa a charge. I new I was supposed to set the type backward and upside down but I felt that made it too hard to read so I just set it backwards. When Grandpa arrived I showed it to him and he did enjoy it though he did tell me the type should have also been set upside down. I explained about the not being able to read it and he let it be. Your story reminds me of an event which happened many years ago. I was showing a customer and his wife around the works,and we were watching a 12x18 windmill working when I was called away to the phone. On my return, I noticed with alarm that the wife holding a very young child in her arms was getting perilously close to the swinging grippers; she was OK and the guard was covering her, but the child’s head was underneath the guard. I did no more than grab the woman by the waist and pull her away, much to her surprise. I then explained the reason for my action, and she was grateful for my prompt but unorthodox action. Windmills can be very dangerous to the untrained. Many country weekly newspapers were (and some still are) located in rickety buildings that no other business would occupy. I started as a printer at age 11, with my first duties being to sweep the floor and scoop up the lead shavings beneath a Model 5 Linotype. I melted the lead, poured pigs, and cast mats and also fed tens of thousands of sheets of paper and envelopes into a 12 by 18 Chandler & Price platen press. After a year or so, the publisher trained me to run the hand-fed Miehle cylinder press to print the tabloid newspaper. The paper had a circulation of 750, and I hand-fed each sheet of newsprint into the beast, later flipping the paper and printing the other side. The publisher, a cigar-smoking curmudgeon, was not kind about miss-feeds. If a sheet wrapped around the rollers, he would bellow from across the room, usually from his chair at the Linotype, “Practicing, Al?” One day, I was in the middle of a run when there was an explosion. A 10-inch gear on the opposite side of the press broke, flew off the shaft, and embedded itself into the wall of the ancient building. I can still hear the sound. The press, needless to stay, stopped instantly. Fortunately, after we dug the gear out of the lath and plaster, a machinist in town was able to repair the press, and we got the paper out on time. Here’s another one, about the longest hand fed press run I ever encountered as an apprentice letterpress operator. The time was circa 1975, during the height of the trans-Alaska pipeline construction in Fairbanks. The job was for 40,000 Number Five Tags, to be used as airline baggage claim tags. Printed two sides with handset and Linotype, numbered (forward) two places on side two, with a perf to separate the claim stub. I got pretty good at taking a dozen tags at once from the feed table, and slipping them into the McGill pins one at a time on the C&P 12 by 18, and then picking up the next right hand full - without touching the impression throw-off lever, or taking my eyes off the bone-crushing jaws. I averaged about 1000-1500 iph overall. My other apprenticeship duties were not to be ignored; I printed as many as 5000 baggage tags one side on a good day. About halfway through the second side - 60 thousand imps, and three weeks into the run - I asked a sales rep why there were 4 cases of finished product still sitting on a pallet in Will-Call. “Oh, we just found out, he said, dryly. You can image my chagrin at the time, but I could never regret the experience. I really appreciate all the great stories. In lieu of a story I offer you this..
And so I pack the final platen. I’ll load my plate, with ink from Van Son. I’ve set a chase that’s full. I’ll print it my way. Em quads and quoins, too many to mention. I printed it my way. I inked it up and fed it out. And printed it my way. Ive loved, Ive laughed and cried. Ive had my fill; my share of embossing. For what is a printer, what has he got? And listen not, to those who are daft. I’m new here, but I would love to see this thread continued ad-infinitum. There are so many good print shop tales of horror and woe, and love and laughter out there. I will never get tired of reading them. Especially the remembrances of the veterans of letterpress - those who were hand setting type and printing, decades before the “O” word existed - of which there seems to be many here, on the BriarPress forum. The history of letterpress printing is a continual work in progress, as is the craft itself. Many thanks to Bill Cook, of Waldwick Printing fame, for starting the “Great letterpress stories and anecdotes” thread. This goes back to the late 70’s when a lot of letterpress type and equipment was simply being scrapped and dumped. I had the opportunity to see if there was anything I wanted in the way of type from a local commercial printer that had gone totally offset and phototype. Unfortunately, I didn’t react immediately and by the time I did finally go there a few days later, the “dumping” process had already begun. There was still some handset type that hadn’t been disturbed yet, so I did manage to get a few cases of desireable type while I was there. Several of the things I would have liked had already been dumped. There, in the composing area of the plant, were several skid cartons being filled with linotype slugs and handset type. The cartons were probably 1/2” thick and built to handle materials like this. They had hired several high school/college-aged kids to do the dumping. When I finally cashed-out and paid the foreman for my type, I asked him what they intended to do with all the lead. He said they would ship it out as scrap. I then said “Good luck with that, you’ll never get it out of here.” He looked at me very strangely and then I explained that all of the cartons were filled while they sat directly on the slab floors with no pallets underneath them!!!!! There was probably no way to lift them off the floor like that! A look of panic came over his face as he realized that I was right! I grabbed my type and got out of there before the screaming started! I don’t know if you’re the right generation to know the musician Jonathan Richman, but he came in to my shop today to order a business card. I guess he does masonry because he is one of those musicians with more fame than money, and he needs a card for his masonry work. I know someplace in my galleys of cuts and ornaments I’ve got a Masons symbol- maybe I can use it on this card! What other chance will I ever have in this life to use one of those for that purpose? Unfortunately, Jonathan Richman is an “unplugged” kind of person and when he spotted lead type he says he wants his card printed from lead type. So I say ok because I’m a softie for that kind of thing, and I’m a fan of Jonathan Richman, even though you know and I know that it’s not really the best way to do things when you’re a photopolymer-primarily shop like mine. So… I’m going through my paper packages of type and my galleys of this and that to find something suitable, and I pull one full galley out of the rack and wham! I pi it. Upside down on a box of junk. The galley was a shortie in a rack of long ones. The slip of paper says it’s 12 pt. Nicolas Cochin and it looks like foundry type, so I’m un-pi’ing it back onto the galley and laughing at myself ruefully. So now Jonathan Richman’s card is going to be set in 12 pt. Nicolas Cochin whether he likes it or not. On my way to work this morning, the road was blocked for construction. When following the detour, I noticed something - the “no parking” signs lining the road were the ones we printed for the town of Waldwick 40 years ago! I was so excited; they looked great printed in wood type in warm red. I don’t know how many of these signs are still on the shelf, so I am going to enjoy this detour as long as I can (or at least until the warm red fades out). The first Monday in August of this year will be the 50th anniversary of my enrolling at the Southern Institute of Graphic Arts in Nashville, TN. I think that qualifies me as an old timer. I was running a letterhead on a Miehle Vertical and noticed a hairline in the address line at the bottom of the sheet. I removed the form from the press to check and clean the type but I could not see a problem. After replacing the form and restarting – there was my hairline. I repeated this process three more times with the same result. By now my patience was running a little thin but I was determined to find the problem. I cleaned, brushed and checked the type with a glass but no hairline in the type. Finally I leaned down to get another angle and there it was — a hair from my head was locked between the furniture. Now that’s what I call a hairline. I apologize to those who are newcomers to letterpress and those who have never been around a Linotype. My story is not funny if you have never seen a hairline. The mats used to assemble a line of type are made of brass and have very thin walls. As the mats would age or become dirty these wall would break down and allow the type metal to squeeze between the mats. This “extra” metal would take ink and print a very thin line (called hairlines) between the letters. Usually a light brushing would clean the hairlines but occasionally they required the use of a makeup rule or knife to remove them. You mentioned about the Thompson Auto Platen some time ago on this thread, and after seeing pictures of them it is evident the rollers rode in geared tracks but I have been wondering how the feed sytem worked. It does look similar to the windmill but without the windmill feeding system. I haven’t seen any pictures showing the feed setup. Yes the chain on thr right hand side of the bed provided the drive to the sprockets on the roller cores. These sprockets were in two parts with spring-loading; When the rollers were on the ink drum the two parts would separate and the drive would disengage, and the drum would turn the rollers, as they descended the parts would again lock and the chain supplied the drive. Delivery was by a gripper on the right hand side. The beauty of this system was that it was a straight feed and a straight delivery, with the sheets travelling the shortest possible distance. One disadvantage was that you couldn’t do 2up feeding. There is a parts manual download from metaltype.co.uk which may help, and as you have 20+ yrs exp with windmills you should be able to visualise most of it. Impression control was similar in principle to a windmill with a screw adjuster. The pump was a suction/blast similar to a windmill. Attached is an image showing impression control. Your assumptions were correct apart from the pedal; this is an emergency stop. The feed table is raised by the knurled wheel between the two red circles i have drawn. I’d like to share another letterpress story I heard as a printer’s devil in the early 1960s at The Carthage News, Carthage, S.D. A weekly newspaper printer, P.D., had one of those nightmare experiences. He was carrying a heavy, two-page broadsheet form to the old hand-fed cylinder press when he tripped over a raised board in the floor. In the process of trying to catch the form before it hit the floor, his knee caused the type in one page to pi onto the floor. P.D. did not say a word. He set the form down, walked across the street to the bar and got drunk. Later, he came back, reassembled the page and the paper got out on time. My first paying letterpress job was hand-feeding a Miehle flatbed at an emigre Russian-language daily. No problems until the day the board of directors came to observe, and I forgot to lock the dogs on the bed. Start the press, 15 seconds later the two page chases were thrown into the wall and the forms exploded, with the directors watching. The composing room foreman calmly started picking up slugs and plates and a couple hours later the forms were remade, just a few lines recast, and the paper was a day late but it still got out, and miraculously I still had a job. Not the kind of mistake you make twice. It was a relief when my Dad told me he’d seen Harold Berliner do the same thing when he got his Kelly B.